We’re not likely to see 29 cent gasoline again but amazingly enough, the Tip Top Cleaners is still on the corner of NE 20th and East Burnside. 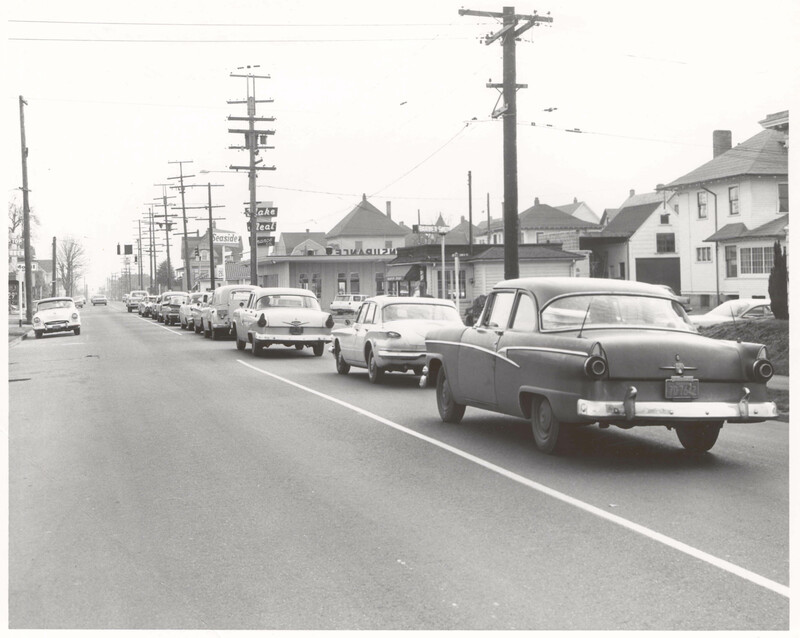 In fact beside some business name changes, this scene, looking south on 20th, has changed very little over the years. 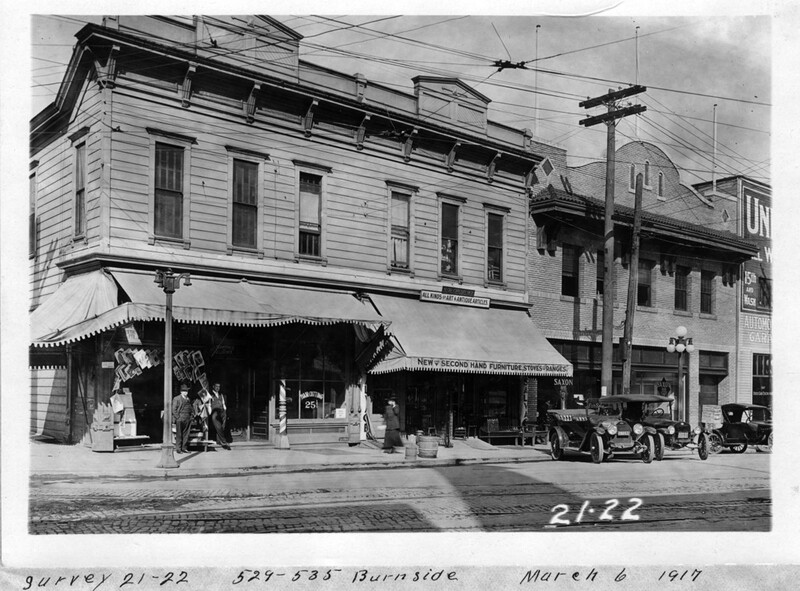 The northeast corner of West Burnside and NW 16th Avenue housed a number of neighborhood businesses in 1917; news/magazine stand, barber shop, second-hand furniture, art, antiques, and a garage. We just can’t seem to leave this intersection, especially when VP fans like Bud Holland keep sending us such fantastic material. Murlark Hall again is the center of the action and the caption pretty much describes the scene. Note the “Benson Bubbler” behind the gent on the fire hydrant. 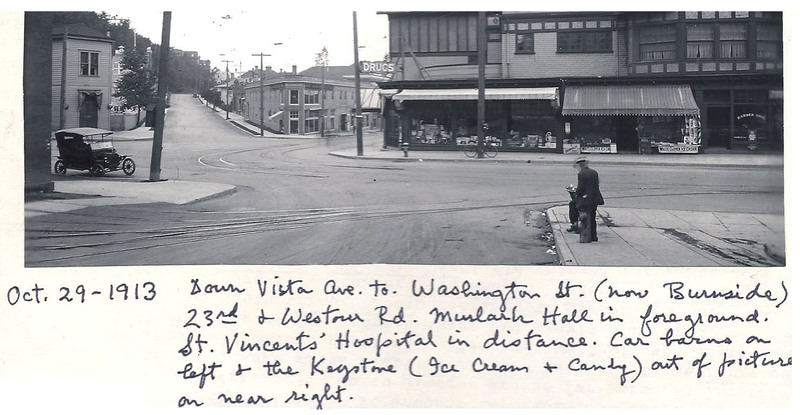 Compare with this 1952 photo from the same vantage point. Thanks Bud, great stuff. If you take the Central Eastside Industrial District/OMSI exit from I-5 northbound, you’ll stop at this intersection at the bottom of the ramp. 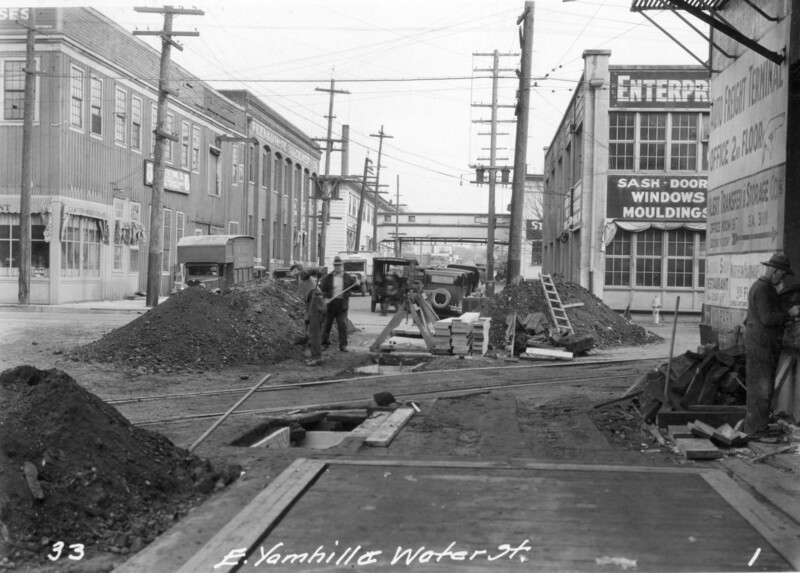 The SE Yamhill Street at Water Avenue area is still mostly gritty industrial; some restaurants, stores and offices may be a little more upscale than pictured here but there has been no wholesale demolition and replacement with shiny objects. 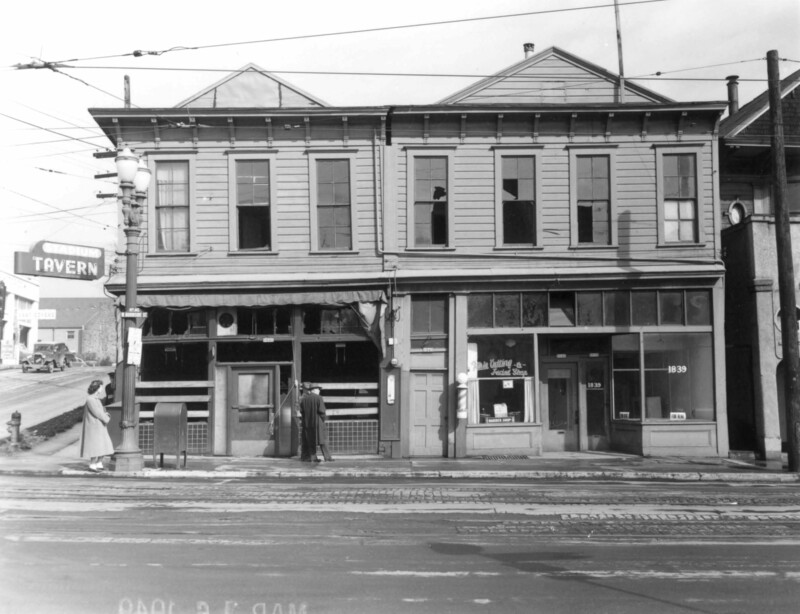 The Stadium Tavern at West Burnside and NW 19th Street suffered a fire in 1949, putting it, and most likely its neighbors, out of business. A McDonald’s sits on the corner today. The stone wall in the left distance belongs to the Trinity Episcopal Cathedral. 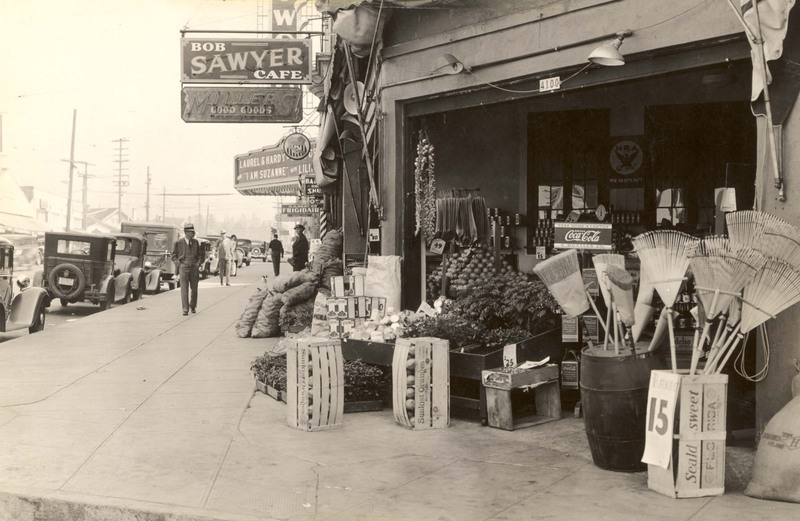 It looked like a fine day for some open-air shopping at this market on NE Sandy Blvd. at 41st Avenue. 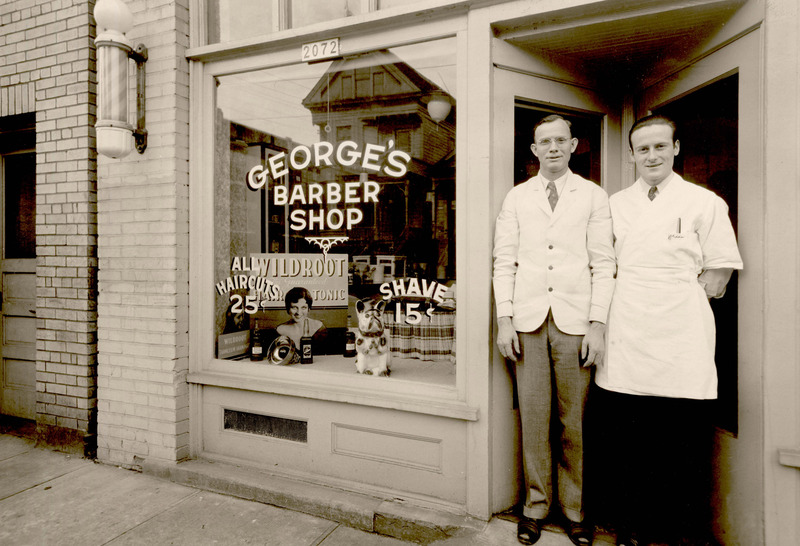 In 1934 you could get a rake for 15 cents or buy items with brand names we know today; Coca-cola, Vigoro, and Sunkist, for instance. A Laurel & Hardy movie was playing a few doors down at the Hollywood Theater.